Who says an economy-minded car can't be both practical and fun? We answer this question with the introduction of our performance and sport product line for the Mazda 2. Designed to enhance the fun-to-drive factor of Mazda's entry level subcompact car, these Racing Beat performance products have been engineered to appeal to both the practical and sport-minded Mazda 2 owner. World-renown in Mazda racing circles, over the last four decades, for offering an outstanding combination of quality and performance, Racing Beat products are designed and manufactured by one of the industry's most respected names in Mazda performance. 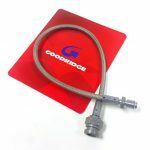 Racing Beat has teamed up with world renowned hydraulics supplier Goodridge LTD (UK) to offer a line of braided stainless steel clutch lines for the 1981-85 and 1986-92 RX-7 applications. Hard to believe that this gap has existed for all these years in their product line, so we reached out to see it they’d be interested in producing these lines for us. The answer was obviously “yes”, and we now have these high-quality lines available exclusively through Racing Beat. Exact fit, great price, check it out! Racing Beat is back again in the just-released Xbox game, Forza Horizon. Unlike a typical racing game, Forza Horizon is an open-world game which allows the game player to explore, race, and drift along the vast highways of Colorado while attending the fictional Horizon Festival. The goal of this game is to earn fame by competing in various competitions while driving fast, destroying property, avoiding traffic and causing general mayhem along the way! K&N Replacement Filter For Your Mazda 2.